* At first, the Amber is a supporting player sharing the spotlight with spices. Nutmeg and cloves have a major role with some pepper in the background. * The initial stage is bracing and a bit aggressive. Some have compared it to paint or turpentine, but I don’t think its unpleasant. For the first part, it’s one of those fragrances that smells better from a little of a distance rather than up close. * The spices recede and the amber comes forward with a little bit of a soapy feel. There are some floral tones in this, mid-development, that I can’t make out clearly. Definitely a dewy rose, but the rest I can’t place. * Surprisingly, once the top notes go away, this isn’t as brash or aggressive as you might expect with the high concentration. It’s definitely present but not overwhelming. * After several hours, the amber warms up to a lovely skin scent, with support from sandalwood and a light musk. Oud is listed as a basenote but I didn’t get that at all. Summary: Bond No 9 New York Amber is a great fragrance that a lot of people will really like. As much as I like it, I wish it projected more and was a bit more intense (like my favorite Bond – New Haarlem). That’s just my tastes though. It’s definitely not mild – but it’s not over the top either. If you want something that is in between, this could be your amber. 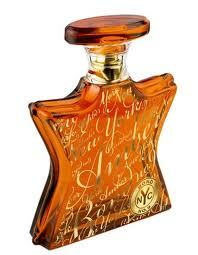 Bond No 9 New York Amber is available from Saks Fifth Avenue and Bond Boutiques. I think this is a good fragrance but the price keeps me from thinking it’s a great fragrance. Like you, I associate quality with projection and longevity. I can see why someone would buy this. I don’t see myself buying it. There are other ambers out there that I love and that are cheaper.